#CDNmoney is a weekly twitter chat co-hosted by Christa Clips: Save-at-Home-Mom and Common Cents Mom Hollie Pollard. Join us 7-8pmET for money minded tips & tricks! 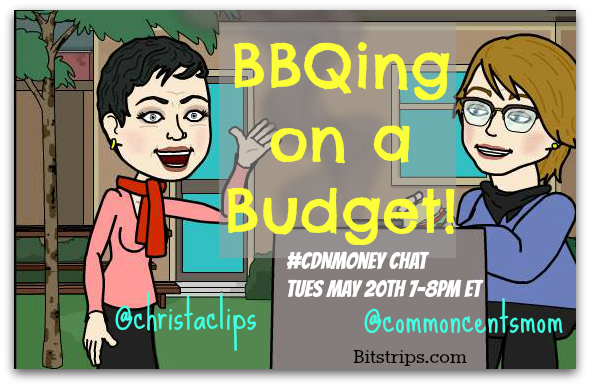 Join @CommonCentsMom and I as we co-host this week’s #CDNmoney twitter chat with tips & tricks on how to BBQ on a Budget! This meal used 5 minutes of propane with one burner on medium heat. 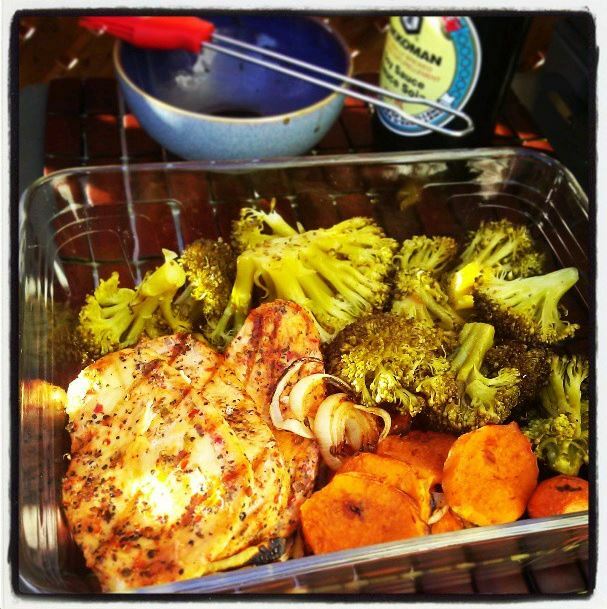 Christa Clips shares easy steps on how to “harness the heat” and BBQ for less! May 2013: I know me. And “me” isn’t likely going to cook tomorrow night. In addition to our family meal, I cooked a second meal on the BBQ tonight, almost entirely after turning off the burners. Broccoli with butter and spices wrapped in foil took about half an hour, turning once. Chicken breasts directly on the grill about 7 min/side while the BBQ was still at 500 from the first round of cooking. Sliced sweet potato and onion basted with Soya sauce on each of 3 flips needed an extra little punch of flame to crisp up since I’d lifted the lid so many times. Total propane sent on this meal: 5 minutes medium on one burner. Hydro Time-of-Use rates change in Ontario on May 1st, 2014. 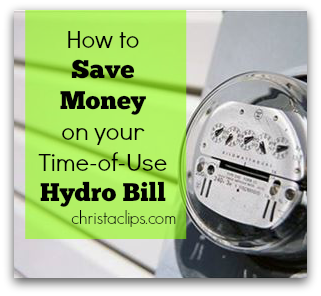 Christa Clips shares easy steps to change your hydro habits to cut your electricity bill. May 1st marks the change of Ontario Hydro Time-of-Use rates. Are you being savvy about your hydro use by turning OFF your appliances during peak times to save money on your hydro bill? As part of my Save-at-Home-Mom savings strategy, I make it a priority to adapt my cooking and cleaning routine to stay in the green. These savings tips originally appeared in my guest post on Mrs. January in November, 2013. Source: HydroOne.com – rates were accurate at the time of this post on May 1, 2014. Here are some changes that are easy to implement and will make a big impact on your hydro bill if you can do the majority of your cooking, cleaning and use of electronic devices outside of those dreaded RED zones. Implement a “last call for showers” so that everyone is out of the shower, the exhaust fan can be turned off, and the hot water tank can refill completely by the time the RED zone kicks in at 7am. Shower doors don’t open again until 7pm! If you must do laundry during weekdays instead of during the GREEN zone (weekends), get your load in first thing in the morning and make sure the washing machine and dryer are turned off by 11am. Better yet, try to hang your laundry whenever possible. Check out the printable coupons from Hydro One to save on drying gear! Charge your laptop, cell phones and other electronic devices overnight so that you can unplug and work off of the battery during the day. Recharge if need be during the YELLOW zone and unplug between 11am-5pm if at all possible. As always, unplug any electronic appliances and devices that aren’t in use – they still draw a small current even when switched off and can add to your monthly hydro bill without your knowledge. Investing in a power bar with a timer is well worth the savings – here’s a printable coupon from Hydro One! If your meal time falls within the RED zones, cook during the GREEN or YELLOW zones and keep food warm on the burner or in the oven until serving time – both take a long time to cool down after you’ve turned them off if you don’t lift the lid or open the oven door. Don’t run your dishwasher outside of the 7pm-7am GREEN zone. That is all. Adjust the thermostat when you’re not home. When you are home, get the house to your preferred temperature before the RED zones kick in and then use the fan only to circulate the air until you can top up the heat/cold again when the zones change to YELLOW or GREEN. 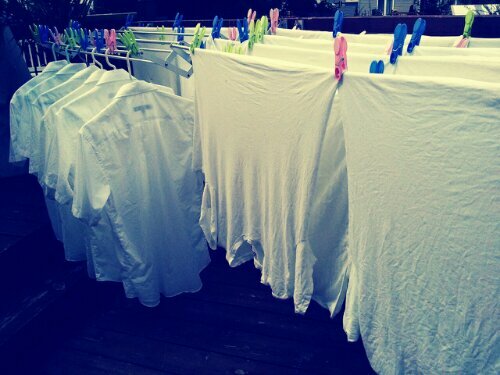 Hanging laundry outside on a sunny, humid day means the whites bleach naturally AND the wrinkles fall out on their own! Start small by implementing one or two of these simple changes until you’re in the routine of saving on hydro. With the Canadian climate, we’re obviously going to have some lighting and heating/cooling costs during the RED zone, but by keeping your cooking, cleaning and use of electronic devices to the GREEN and YELLOW zones, you can save a bundle on your electricity bill. Hydro One has some great info on their website, click through for more energy saving tips and printable coupons to help you save when updating your light fixtures, light bulbs, power bars, etc. How have you been trying to save on your Hydro bill? Please add your comments below! #jeudi confession: I won’t miss hanging socks! 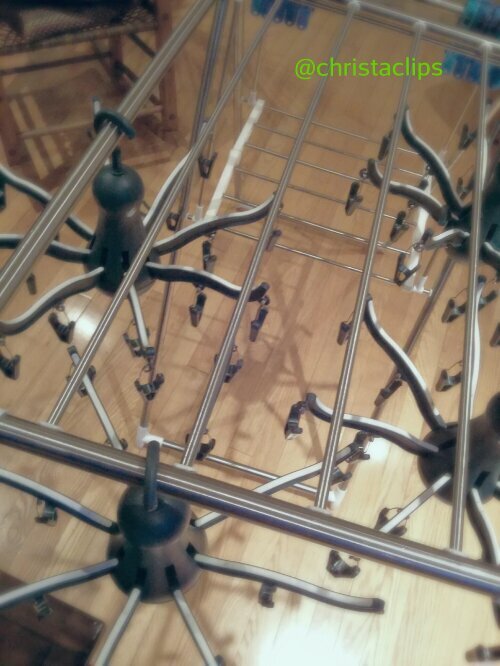 These IKEA hangers are what we’ve been using for the past year to air dry our socks & undies! Placed over an air vent, they dry within 12 hours. Outside, usually an hour or two does the trick! Our washing machine is on its last leg (literally! It jumps about a foot on each spin cycle and can be heard from the street! The machine is balanced but the innards aren’t). So after 12 yrs with the same machine, and over 14 months of living dryer-free, we bought a new washer and dryer this week. I don’t plan on drying everything, all the time, but I must confess, I won’t miss hanging everyone’s socks! Stay tuned for what this means for my life as a dryerless dame!